You are here: Home / Community / rePlanet where? I recycle…because it’s the right thing to do. In fact, don’t we all buy a myriad of containers that can be recycled? …even paying just a little bit extra each time I take home that 2 liter of soda or that 6-pack of beer. And that’s ok really, because it’s that small nudge, that incentive to eventually return them. I know it’s the law that the retailer must collect the CRV and I know that the law is designed to help the environment so I’m cool with it. I save the scads of bulky containers, which consume a good chunk of real estate in my garage. And then it’s time. Time to finally bring the lot to where it can begin its second life. But where do I go? 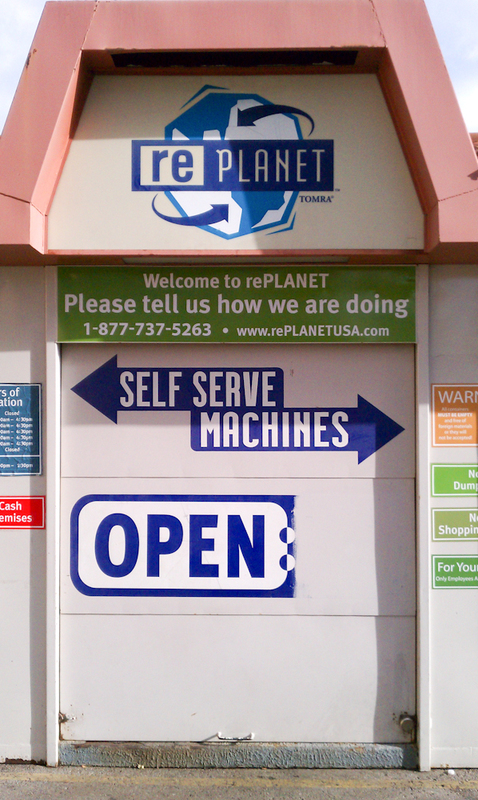 Well, the Vons in Montrose had a rePlanet recycling center but when the store was remodeled a while back the rePlanet center was removed. I remember thinking that it would have to come back but it never did. So what should I do? I have a car full of containers that I want to recycle and no place in my neighborhood to go? 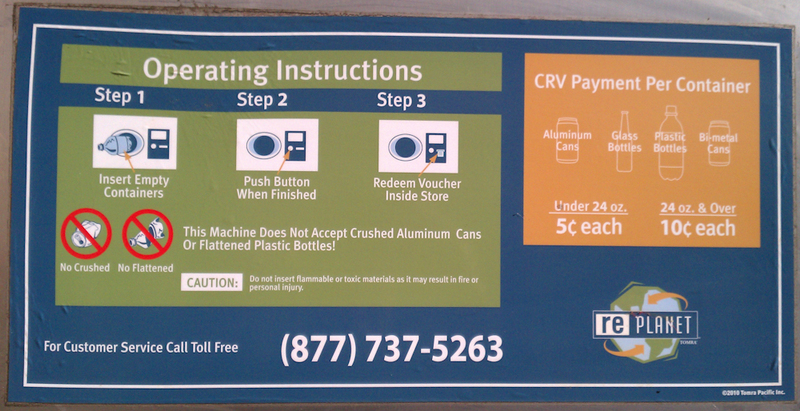 I vaguely recall there being a recycling container in Tujunga behind Albertsons. So I shlep the containers of containers all the way down foothill and pull up to the unit. You know the one: big grey shipping style container (rePlanet) with bright colorful earth friendly paintings all over the sides. Cool, no line. I pull up closer. And it’s closed! c#&p! I check the hours. Open till 4:30. Check my watch and it’s only 3. Double c#&p! because now I’m thinking I have to haul the lot back home with me. The next nearest rePlanet container is 10 miles away, still in Glendale but very close to Eagle Rock. So, here’s my gripe: we are encouraged to recycle and yet are provided so few places to bring those recyclables. A hundred stores sell bottles and cans and charge the extra deposit but so few help take them back… On top of that why are they only open until 4:30? Don’t they know people have jobs? That people need to stay at work until at least 5PM if not later? I mean seriously, whatever time they sell the drinks they should be forced to take them back and give us back our money! So I decided to do some digging. According to a pamphlet on the Cal Gov/Cal Recyle website. Stores that do more then 2 million dollars in business a year are considered a convienance zone. Inside that convenience zone the store is requried to have a recycling collection system within .5 miles of the zone. I’ve copied the text for you to read below. So my question is why don’t more of the local stores have recycle centers? If the grocery store chain believes that we need the local supermarket why don’t they think we need places to drop off our bottles and get back the money that we paid for them? I learned that the retail stores can apply for an exception but I don’t know how to find out what stores have been given the exception. 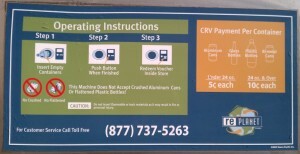 I found this notice at http://www.calrecycle.ca.gov/BevContainer/Notices/2011/CZJan.pdf on the website of Department of Resources recycling and Recovery, Division of Recycling. I contacted them and after identifying myself I left a message but never heard back. Yeah, I’m shocked as much as you are. In my message I asked how the public can find out what stores have received the exception. Yup, no answer. Is it me or does it just seem like no one in government ever listens to the public? Yeah I feel the same way. back the CRV they paid at your store. with the name and address of the recycling center. Just wondering .. Could Glendale not be enforcing the recycling stations at stores because they would rather you use their big gray bins? Less cash in your pocket. More recycling revenue for them? Take them to the Glendale Recycling Center on Chevy Chase and San Fernando. The guys are fast, friendly and helpful. They take everything! Somethings very very wrong, the people are being treated wrong. The stores are doing wrong and they have no consideration for the people. On top of all that, what happened to a government that should be “of the people, for the people and by the people”? We are the victims! How do we make this change?